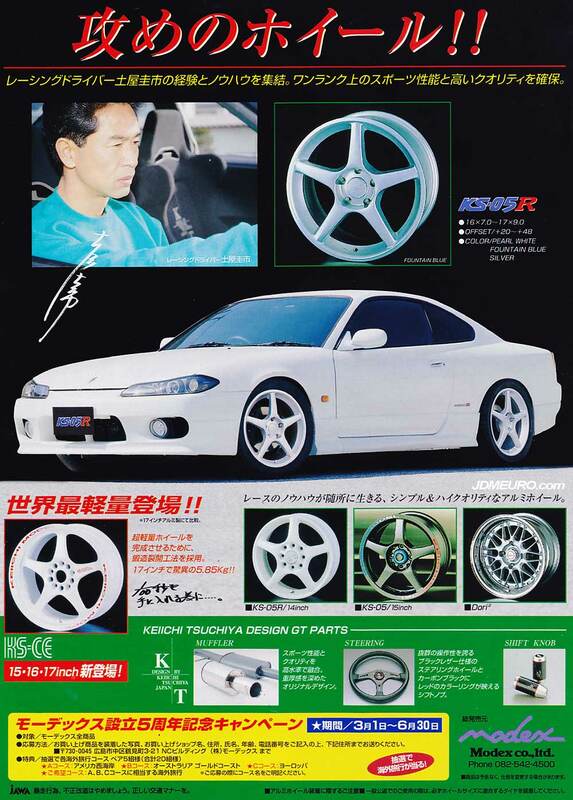 Although there is a nice s14 Nissan Silvia on Modex KS-05R pictured; my favorite items on this page are the Modex Dori Dori wheels more commonly known as the SSR Dori Dori Mesh, and the Modex Keiichi Tsuchiya Steering Wheel pictured below. The Modex Dori Dori / SSR Dori Dori Mesh are a gorgeous 2 piece (really 3 piece welded) wheel with split spoke mesh face and stepped SSR Formula barrels. The Modex Keiichi Tsuchiya Steering Wheel is a rare cool piece from the drift king with slanted spokes much like a Nardi Side Spoke steering wheel. Also noted is there are 3 versions os the Modex KS-05 wheel. It seems the main difference of the Modex KS-05 and the Modex KS-05R is the slanted lip on the Modex KS-05R and the squared off lip on the Modex KS-05; with that being said there is the Modex KS-CE which has an extended stepped lip.